We’ll never stop being completely floored by the tremendous hearts and generosity that our Camp owners have to offer — not just to our Campers, but to those in the community in need as well. Those just like Jeff Mullins, a veteran and vice president of operations at Rebuilding Warriors, and his dog Zoey. Back in 2015, Camp Bow Wow Lawrenceville owner Louise McKeown teamed up with Rebuilding Warriors to raise funds for a great cause. Rebuilding Warriors is a nonprofit that operates out of Norco, California. 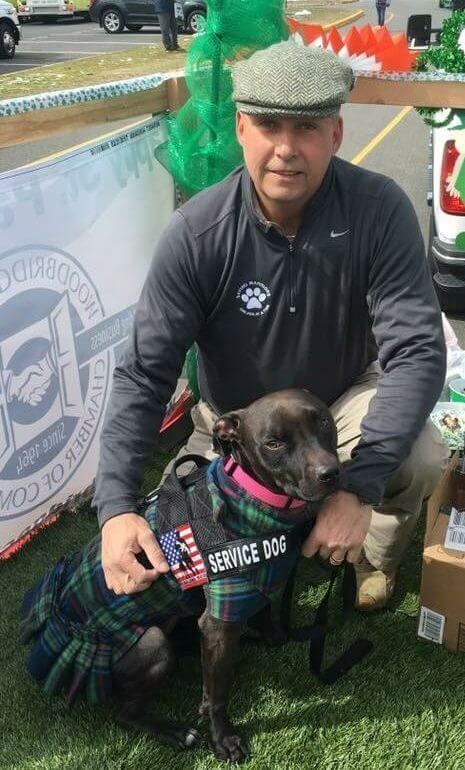 Their primary goal is to match service dogs to veterans in need of assistance due to amputation, post-traumatic stress disorder (PTSD) or traumatic brain injury (TBI). Fast forward to now, Louise and the Camp Bow Wow Lawrenceville team are at it again — but this time for the long-haul. Beginning in the New Year, Louise’s Camp will be sponsoring a furry friend who will go through a year-long training program to become a service dog. All-in all, the program will cost about $12,000 in total, but to Louise it’s all worth it, and then some! Rebuilding Warriors has matched more than 65 veterans with dogs to date, and they’re still constantly evaluating applications and assessing veterans’ needs each and every day. The organization is a true non-profit, run by a staff of 100% volunteers. That means every single dollar raised goes to the cause, or in this case…the dogs! Camp Bow Wow is thrilled to have the opportunity to help our country’s veterans succeed. After all, they’ve done a great deal and made many sacrifices to help our country succeed, too! Don’t forget to check out the full story from Town Topics! Camp Bow Wow is committed to providing top-notch doggy day careand training services, as well as emergency assistance to pets in need through our very own non-profit organization, the Bow Wow Buddies Foundation. To learn how you can become a part of the Pack and set up Camp in your local community, request your complimentary executive summary online or call us at 877-700-2275. And, don’t forget to lend a paw and donate to help us continue offering pets a new leash on life!